How do you feel when you meet someone for the first time? Are you eager to flash a bright smile? Or, are you busy worrying about what that person thinks of your crooked teeth? You’re not being irrational for worrying about the appearance of your teeth — after all nearly one-third of Americans say that a person’s smile is the first thing they notice. If your crooked teeth that are negatively affecting your confidence, you might want to consider working with a dentist or orthodontist to improve the appearance of your smile. Traditional metal braces aren’t the right option for everyone with crooked teeth. In many cases, Invisalign braces can be a more effective option. Read on to learn more about Invisalign and the benefits that come with choosing them over traditional braces. Invisalign braces are a highly discrete option for straightening your teeth. 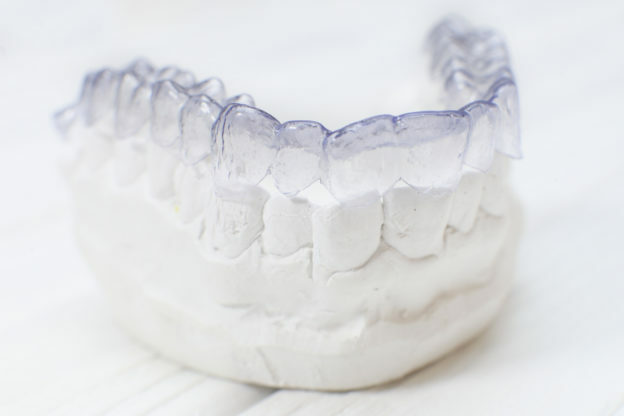 Instead of unsightly metal wires and brackets that are cemented to the teeth, Invisalign uses aligner trays that are made of a flexible resin and molded to fit your teeth. These trays gently shift the teeth into a new position over time. If you choose to straighten your teeth with Invisalign, your dentist will make a mold of your teeth and customize the trays to fit them. Every two weeks, you’ll receive new aligners to accommodate the changes in your teeth and keep them progressing. In most cases, your teeth will move approximately 0.25 millimeters with each new set of aligners. Invisalign aligners are very easy to use. All you have to do is pop the trays into place and wear them throughout the day and night. They might take a few days to get used to, but, after that, you’ll probably forget you’re even wearing them. You can take your aligners out to eat or brush your teeth, but you’ll need to wear them for the rest of the time to really make an impact on your teeth. The most obvious benefit of Invisalign braces is the fact that they are practically invisible. This makes them particularly appealing to adults who feel self-conscious going to business or social events with chunks of metal glued to their teeth. In most cases, these issues arise because people with traditional braces have a harder time thoroughly brushing and flossing their teeth. As a result, plaque and tartar can build up and eventually cause more serious issues like decay and infection. With Invisalign braces, you don’t have to worry about this because you’re able to take the trays out and thoroughly clean your teeth in the morning and at night. The duration of your treatment may vary depending on the severity of your specific issue. But, with the exception of cases of severe crowding or jaw misalignment, almost anyone can use Invisalign to help straighten their teeth and improve the appearance of their smile. It can be frustrating to have so many foods and drinks be totally off limits for an entire two years. Luckily, you don’t have to deprive yourself if you use Invisalign to straighten your teeth. You’ll be able to enjoy these foods and drinks without any fear of breaking a bracket or increasing your risk of developing a cavity. Since you can just take out your aligners to eat or drink, it’s easy to enjoy some of these forbidden foods on occasion. Just make sure you brush your teeth well afterward. Metal braces can be quite painful. With all the wires and brackets involved, it’s easy to experience cuts on your gums and tongue. Many people also develop canker sores from the friction that occurs when their tongue rubs against their brackets. If you play sports, traditional braces can also be dangerous. Getting hit with a ball or colliding with another player could result in a series of painful cuts and lesions. With Invisalign, you don’t have to worry about these kinds of injuries. The aligners are made from a soft material that fits snugly over your teeth. There aren’t any sharp edges to cut yourself on. Thanks to their close fit, Invisalign aligners are also perfectly safe to wear while playing sports. One of the greatest benefits of Invisalign braces is the fact that the whole treatment process is significantly shorter, even in more complicated cases. Most people only need to rely on Invisalign for between 12 and 18 months. This is approximately half the treatment time of traditional braces. You also don’t have to visit the dentist as often when you have Invisalign. If you’re a busy professional or just someone who hates the dentist, this is a major bonus. You’ll need to go in approximately every six weeks to check your progress, but that’s it. With traditional braces, you typically have to go in every month, or sometimes even more frequently. Do you think Invisalign braces could be the right treatment option for you? Do you want to learn more about the procedure? If you live in either the Chicago or Frankfurt area, contact Dr. Laurie Schumacher today to schedule a consultation and learn more about how Invisalign can fix your smile. This entry was posted in Cosmetic Dentistry on March 27, 2018 by Dr. Laurie Schumacher.